It’s no secret that Android and Apple’s Mac OS X system don’t get along very well. This doesn’t come as much of a surprise, as anything other than an iPhone won’t offer nearly the same compatibility with the Mac. Android devices, however, are particularly incompatible with Apple’s Mac and any sort of interaction between the two, no matter how small the task, will not be easy because it requires a distinct utility and does not work on the native Finder. There is the Android File Transfer, offered by Google, but it is a bit out of date. While some people may think that it would just be easier to have an iPhone if you have a Mac – and they probably would be right – there are many people who use Android phones because they prefer them. Or perhaps that is what they are provided for work. Whatever the reason, they should be able to connect their Android device with their Mac computer and share all of their files and information amongst the two. Of course, this isn’t easily done. Although it seems impossible, there is still hope. There are numerous third-party tools are accessible whose main objective is to bridge the gap between Android and Apple. Although there are many available, there isn’t really a one-stop-shop for the problems. Most tools are aimed at a particular problem, but do not offer solutions for bridging the gap overall. Here, we will see the 7 best Android tools that can be used for the Mac. As mentioned before, there isn’t one simple solution for creating a line of communication between your Android device and your Mac. However, this tool is one that is close to getting the user an overall fix. AirDroid is able to call alerts, app alerts and push notifications from your Android device over to your desktop. The way it is set up allows complete Android mirroring on your desktop, which gives you the freedom of interacting with your Android device through the use of your computer. Another feature of AirDroid is that it allows simple, wireless file sharing between your devices. 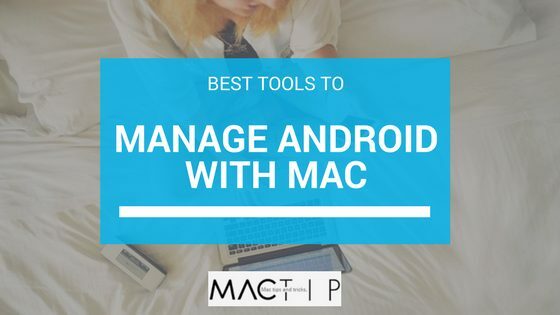 This is what makes it the best choice for managing your Android and Mac needs. It is most definitely preferable to the Android File Transfer offered by Google. 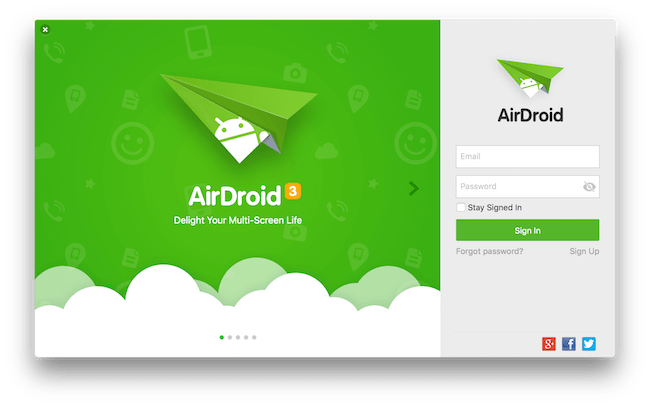 AirDroid offers both a free version, which includes the use of many features, and a paid version, which obviously includes much more. The premium version starts at $1.99/month and is full of helpful features such as limitless file transfer, transfer of entire folders instead of just files, the use of multiple devices on one account, remote camera, and many more. While the free version is very useful, the low price and extra features of the premium version are absolutely worth the low cost. If you are willing to spend a bit more money and are in search of a more inclusive solution, then Wondershare MobileGo for Android Pro is a good option. It is a Mac desktop manager for Android and offers the full package. This tool offers device storage backup and restore, content management, selective backup, file transfer and sync, text message management, and many other options that are incredibly effective in keeping both of the user’s devices up to date. Basically, MobileGo is to Mac as iTunes is to iPhone. For example, the backups that you create with the tool can be complete backups or partial ones and are easily restored with just one click. Also, transferring content such as videos, music, photos, etc., is very simple. The support extends to iTunes, as well, making it incredibly useful. It gives you the choice to send and receive text messages, and even of generating an SMS backup version if you like to keep some of them. It is very easy to install and uninstall, as it comes up with an app manager. Wondershare MobileGo is an incredibly useful package and overall incredibly advantageous to have. Its only downfall is that it comes at a bit of a higher price. It costs $39.95 for a single-PC license, but it truly is worth the price. Another huge challenge that Android users face with Mac PCs is being unable to keep their photo libraries in sync. Whether the user has a lots of photos on their phone that they want to transfer to their Mac, or vice versa, it is an annoying problem to have. This is where Google Photos comes in. Google Photos is the cloud storage used by Google with limitless storing for high-quality photos. It is as simple as installing the app, enabling backup, and there you have it. You are ready to go. Download the Google Photos Desktop uploader to your Mac PC and install. By doing this, the user will be able to get all of your current Mac photos into Google Photos. Import your photo library from the app into the uploader, and upload everything into the cloud. It may take a while depending on how big the user’s photo library is, and the internet speed. Download and install the Google Drive app onto your Mac PC. Sign into your Google account on drive.google.com. Go to Drive Settings and allow the option “Creating a Google Photos folder”. From there, Google Photos does all the work. All of the Google Photos will sync within a dedicated folder within the user’s Google Drive. However, the two-way sync is limited. Anything that is deleted from your Google Photos will be deleted from Google Drive as well (and vice versa). However, everything that is added to Google Drive isn’t automatically added to Google Photos. Additional photos still must be added through the Desktop Uploader or via Google Photos Android app. There once was a time when the Titanium Backup was the best backup tool for Android. However, the times have changed, along with the backup tools. 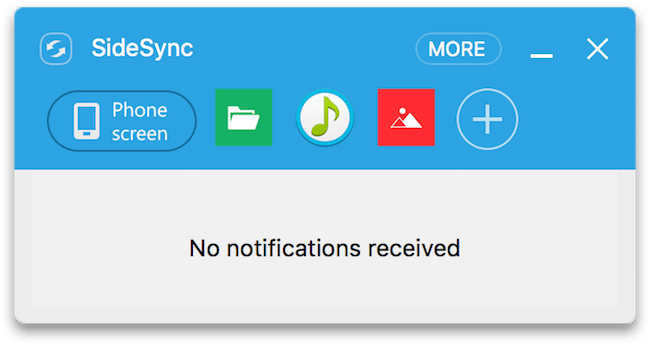 If you are looking for a simple app sync and backup system for your Android that is compatible with Mac, and is cheap or free, then Helium is the way to go. The idea behind Helium is that it not only lets you to backup and sync your regular calls, texts, and settings, but it also lets you to backup and sync your installed apps to your computer’s storage, cloud storage, or even between different Android devices. What truly sets this tool apart from others is its accuracy and authenticity of the backup service and app syncing. If you are someone who uses many different devices all the time, Helium can be a life-saver. Helium is primarily used with your Android device concomitant with a desktop app. The first time you run the app, you must connect your device with a PC using a USB cable, and each time you reboot your device after, the process must be repeated. Besides that, the app works self-reliantly on your Android device and lets you to backup and sync as you please. This app is free, however, there is a premium version, which will get rid of the ads, support cloud and programed backups, work between Android devices, and even more. The cost of the premium version is only $4.99, and a worthy purchase. One of the biggest issues that Mac users have with Android devices is that they are not capable of syncing their music from iTunes with the Android smartphone. double Twist is made especially for that and nothing else. 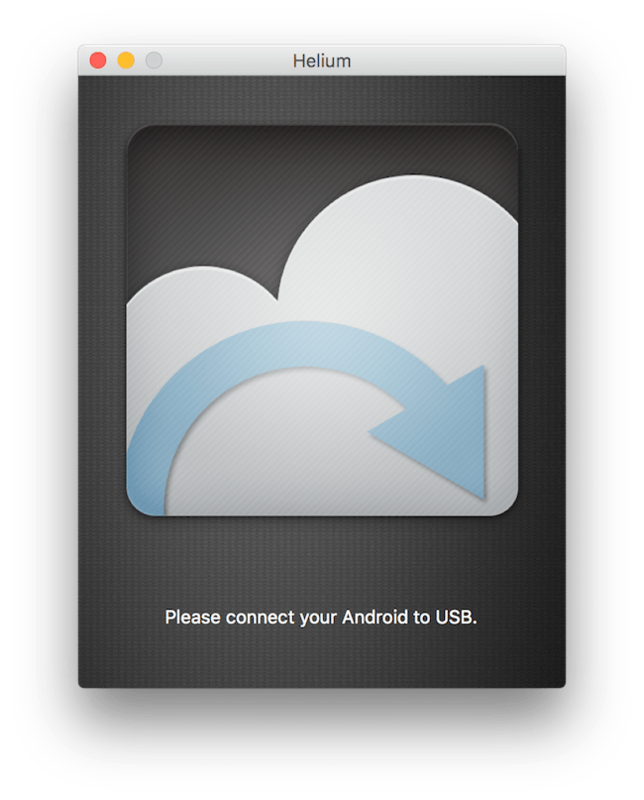 It is a free app and once your Android device is connected to your Mac via USB cable, it picks up your iTunes and syncs it on both devices. double Twist Sync also offers two-way syncing. This means that any changes the user makes in their iTunes library on their device are carried over into their iTunes library. This includes any additions or removals to playlists. As was stated earlier, there is a free version of this app and it relies only on a USB connection. However, there is an in-app purchase available which enables AirSync and does not require a hardwire connection. 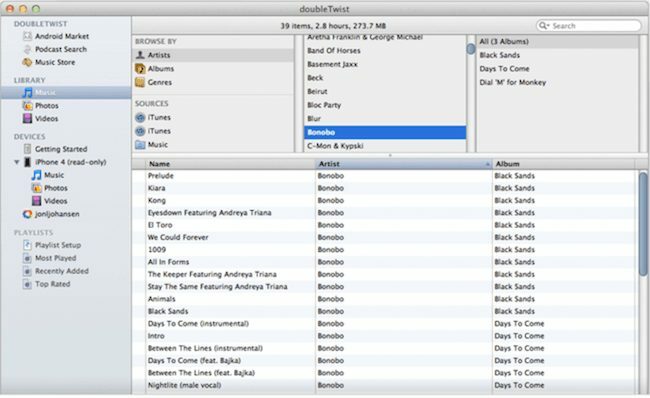 Whether you go with the free version or decide to upgrade, double Twist is a very useful app that enables you to have your music with you at all times. SideSync is a free desktop manager for Samsung Android smartphones. This may seem a bit limiting, and probably is. However, a large number of Android smartphones available in the market are made from Samsung. The SideSync app will work with any Samsung Galaxy device that run Android KitKat or above. SideSync is pretty much everything you would expect from a desktop manager app. This includes showing and being able to respond to notifications, transferring files and media, mirroring the entire device and all of its content, etc. What’s the great part? It’s absolutely free, and it really works! An extremely useful part of the mirroring of the device is that it enables the user to screenshot and capture images even when it might otherwise it’s difficult to do so. It also allows the user to share their PC’s mouse and keyboard with the phone. This can be an extremely helpful feature when it comes to playing games and texting. SideSync can work both with a hardwire (USB) connection, which is much faster, or on Wi-Fi. It is also available for both Mac and Windows. 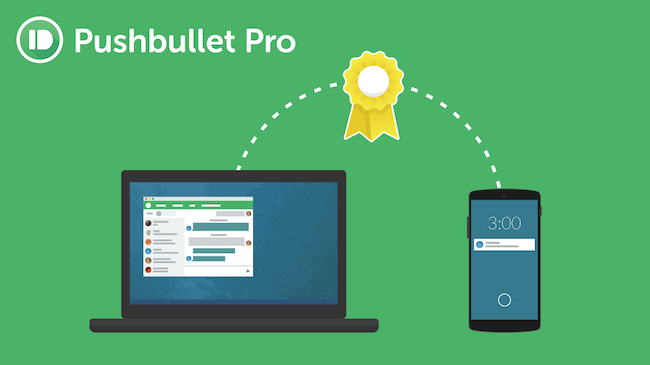 While it may be thought of as pushing it a bit (pun intended), Pushbullet should be included in this list. Basically, how Pushbullet works is that it is an online service, which lets the user to “push” content from the phone to the desktop and vice versa, without the use of a desktop app. It is offered for both iOS and Android also works on a variety of different browsers, including Firefox, Google Chrome, Safari, Opera, and more, so it is convenient for mostly everyone. This service allows the viewing and replying to Android notifications. It also notifies you of many kinds of events, allows you to share files, chat, and a number of other things. It is also very customizable which makes it unique. It uses services such as IFTTT or Tasker, which makes it a good choice. Push Pal is a third-party Mac desktop app that makes it much more simple to access Pushbullet from your desktop. Pushbullet has a Windows app, and Push Pal replicates that app for the Mac. The user simply has to drag content or files that they like to push to their phone to the icon on their toolbar and the app does the rest for you. If you use Pushbullet, Push Pal is a very worthwhile addition. While it is not extremely easy to connect an Android device and a Mac, it is not impossible. These are seven of the best tools that can be used to bridge the gap between the two. However, there are many others that can be used as well. Doing research and testing them out are the best ways to decide which is best for what needs to be done. The direction in which technology is heading is unknown. However, there are so many different resources and tools available to us now in order to connect all of our devices and enable them to sync up. In the future, who knows? Perhaps everything will automatically be compatible and connected. But for now, there are resources available to help us with this and to make our lives easier.